Bitcoin Cash BCH/USD is trading inside the Ichimoku Kinko Hyo Cloud. This indicates the presence of a flat trend on Bitcoin Cash. As part of the Bitcoin Cash prediction & analysis BCH/USD December 30, 2018, the Ichimoku Kinko Hyo Cloud lower test is expected to be near the level of 160. Where can we expect a rebound and continued growth of the BCH/USD cryptocurrency with a target above 240. An additional signal in favor of the growth of cryptocurrency will be the test area of ​​support. Earlier, a weak signal was received for SELL the Bitcoin Cash cryptocurrencies. The signal was formed due to the intersection of the signal lines at level 195. Cancellation of the BCH/USD quotes growth option will be a breakdown of the lower Ichimoku Kinko Hyo Cloud and close below 140. This will indicate a change in the side trend in favor of the downward trend and the continuation of the fall in cryptocurrency. 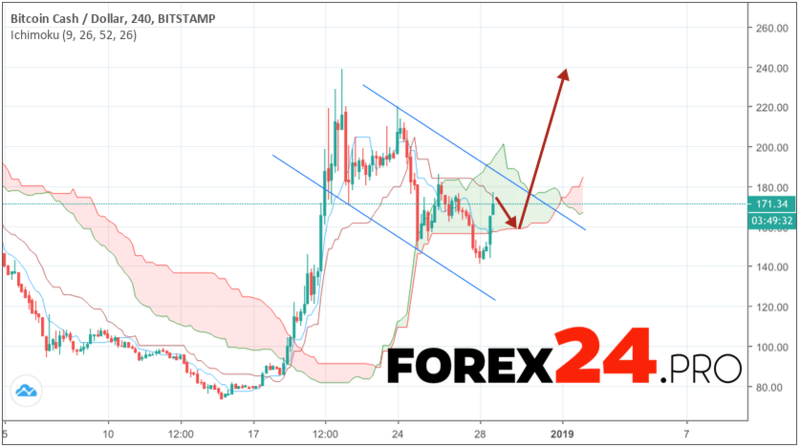 Expect to accelerate the growth of quotes BCH/USD stands with the breakdown of the upper boundary of the downward channel and closing above the level of 195. Bitcoin Cash prediction & analysis BCH/USD December 30, 2018 involves an attempt to correct cryptocurrency and a test of level 160. Where can we expect Bitcoin Cash to continue to grow with a potential target near the level of 240. The decline and the breakdown of the area 140 will cancel the growth option. In this case, we should expect a further decline.